External Affairs Minister Sushma Swaraj today asked the Indian Embassy in Kenya to send the details about reports of an Indian boy being killed in Nairobi. Her response came after one Netra Parikh tweeted to her saying an Indian boy was assaulted at his home in Nairobi at 3 am local time. "Suchitra - Please send me a report on this @IndiainKenya," Swaraj tweeted. Suchitra Durai is the Indian Ambassador in Kenya. Earlier, Parikh had tweeted, "Madam Indian Family boy shot dead in his home in Nairobi. Can you pls check reports & help/support them. Thanks (sic)." She also said the name of the boy was Bunty Shah and he was working in the Bobmil Industries Limited. 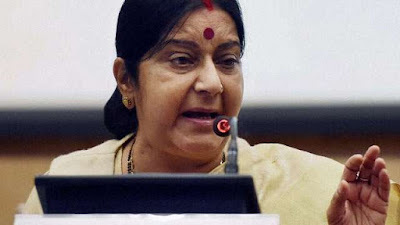 Responding to another request for help, Swaraj asked the Indian High Commissioner in South Africa to help the family of an Indian Citizen, who had passed away while on a tour of that country. The external affairs minister's intervention came after a tweet by one Shweta Kapur: "@SushmaSwaraj An Indian citizen has passed away of natural causes while on a tour in South Africa (sic)."